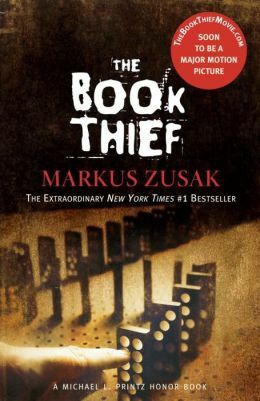 The Book Thief by Markus Zusak is a remarkable tale. Set in Germany during the Holocaust, this story is narrated by Death. Yes, I’m talking about the Grim Reaper himself. You can only imagine the things he has witnessed. At the beginning of the story, Death meets a little girl named Liesel. She is on her way to live with a foster family outside of Munich, because her mother can no longer adequately care for her. Death becomes enraptured by this little girl, and (even though he shouldn’t) he begins to follow her. Liesel is a child growing up in the midst of a world war. Times are tough, money and food are scant. What initially draws Death to Liesel is her book thievery. Liesel was very poorly educated upon arriving in Munich, and her foster father, known to the girl as “papa”, takes the time out every night when Liesel awakens from her usual plaguing nightmares, to read to her and teach her to read and write properly. As you can guess, throughout the book the war progresses, as do the hardships Liesel must come to bare. Liesel is forced to join Hitler Youth, and be a “good little German girl.” But what happens if you don’t agree with what Hitler says? The answer is: You keep quiet about it. Many of the characters in this story completely disagree with Hitler’s message and agenda, but they say nothing out of fear. Because to reveal anything other than complete compliance is basically suicide. You would be publically shamed and taken away from your family. Submission was the key to survival. At one point, Liesel’s foster family ends up harboring a Jew, because of a long ago promise and a debt to be paid. This is an extremely dangerous act of courage. If the family is caught with a Jew in their basement, the outcome isn’t even imaginable. The one thing that Liesel has found to keep her going is reading. It is through books that she learns to build self confidence, imagination, and find an escape from the horrible times. But the thing is, in 1940s Germany, books aren’t easy to come by. Most everyone has lost their job and rations are limited, making things like books nearly impossible to acquire. The solution? To steal them. Now, Liesel doesn’t go on some rampant stealing spree, taking everything she can get her hands on. In fact, the acts of stealing are far and few between. She only takes a book after she has read one in its entirety. As the story continues, you are not only shown Liesel’s life, but Death describes to you the pitfalls of his job. For during a war, deaths are plentiful. Through the eyes of the narrator, you will see that the war was not only difficult for the humans that had to endure it, but for Death as well. Witnessing firsthand the destruction Hitler caused, Death so desperately wanted a new hope—a hope that humans had a purpose and were capable of something other than causing another’s demise. It is through following Liesel that his faith in human kind is constantly restored. To be made to feel like you are so insignificant of a specimen that you aren’t even worth trying to save is a thought that nearly brings me to my knees. And you can barely even call the conditions they endured “living.” And all of this brought on from the thoughts and words on one horrible human being. I give this tale four out of five stars. This definitely isn’t a read that can be rushed through. It’s a long narrative, but it definitely makes you think.